NTU alumni group in Japan met up last week, at a cosy Japanese restaurant, Teshigotoya Seigetsu. This growing group is led by alumni ambassador Itaru Dekio and this was their fourth meeting. It was also the best attended event held so far, with nine alumni attending. There were some regular faces in attendance, along with some newcomers. The next meeting in Japan is set for 13 July 2019 and they hope for double figures to attend next time. If you would like to come along to the next meeting please let us know at alumni@ntu.ac.uk if you are interested in attending, and we can pass your details on to Itaru. NTU’s alumni ambassador in Japan – Itaru Dekio – would like to invite all alumni based in Japan to join him at an event in Tokyo on 19 January 2019. The meeting will take place at Teshigotoya Seigetsu, which Itaru says is “a cozy Japanese-style drinking place serving superb sake and variety of fish and other traditional dishes”. Itaru is keen to invite all NTU alumni based in Japan to join him for this event. He says 'alumni of any age, any department are welcome’ and hopes for more new members to come to the meal. If you are interested in coming please email alumni@ntu.ac.uk before 10 January 2019, and we’ll let Itaru know. Nottingham Trent University was delighted to invite alumni based in Hong Kong to a special reception at the Sky Lounge, 49th Floor, The Upper House, Hong Kong. Vice-Chancellor, Professor Edward Peck, hosted the event and updated guests with the latest news from the University and the exceptional year we have had - none of which would have been possible without the ongoing support of our alumni and friends. You are part of a global network that can help us continue to make a real difference. There are many ways you can continue to be involved, including volunteering your time and contributing your expertise via the Alumni Fellowship Programme or providing opportunities for recruiting and employing NTU graduates or offering work experience to current NTU students. View photographs on our Hong Kong Facebook Group. 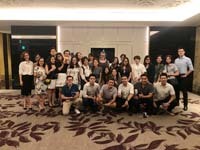 NTU alumni in Vietnam met up in Hanoi and Ho Chi Minh City during July. These events were organised by NTU’s Vietnam Team and this is the third year that they have taken place. The events have become increasingly popular every year and this summer the team welcomed record numbers of alumni guests. This year’s events were hosted by Katy Fair and Duong Quach (Jess) of NTU’s international office. Alumni had a great time catching up and took the opportunity to network for jobs and get career guidance. NTU’s alumni group in Japan met up last week, at a Scottish themed pub in central Tokyo – The Royal Scotsman. This growing group is led by alumni ambassador Itaru Dekio and this was their most well-attended event held so far. There were some regular faces in attendance, along with two newcomers, who discovered that they had spent some time in the same NTU department and shared their memories of this. The next meeting in Japan is set for 19 January 2019, so please let us know at alumni@ntu.ac.uk if you are interested in attending or joining the group, and we can pass your details on to Itaru. Members of NTU’s international Team – Mirza Mujic, Rishi Pokar and Shruti Jaggi - will be travelling in India in June. These events are free to attend. If you would like to come along, let us know by emailing alumni@ntu.ac.uk letting us know which date and location you are interested in attending. and discuss possible future activity. NTU alumni in Korea held a get together in Seoul recently, getting together for a dinner party at 3rd Space in Gangnam. This was a popular event with 38 alumni attending. The event was hosted by Andrew Plant, International Manager for Art, Architecture, Design and Humanities. Andrew was able to let alumni know about recent news from NTU and update them on the recent awards success for the University. It was a great opportunity for meeting up with old friends and networking in Korea. 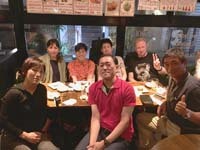 NTU Alumni in Japan held a get together last weekend in Tokyo. Five members of the group met at Usagi restaurant for a great evening of okonomiyaki (a Japanese kind of crepe) on 24 March. The group is led by NTU Alumni Ambassador Itaru Dekio (MRes Bioinformatics 2013). Itaru told us that the group “enjoyed sharing about our life after graduating from NTU”. For most of the attendees, this was their first NTU alumni meeting in Japan. Itaru is planning another NTU alumni meeting in Japan during July or August, so please contact us if you are interested in attending this event or joining the NTU Alumni group in Japan. Nottingham Trent University’s Pro Vice-Chancellor, Professor Cillian Ryan, invites alumni based in Singapore to join him at a celebration event on Wednesday 28 March 2018, at Bistro 1855 (Suntec City Mall East Wing). This event is to celebrate NTU’s exceptional year after being named UK University of the Year and Modern University of the Year. If you would like to attend, please book your place by emailing us at alumni@ntu.ac.uk by Monday 26 March 2018. 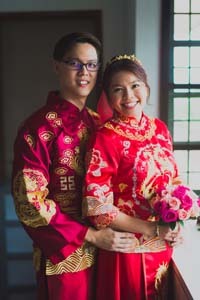 NTU’s alumni ambassador in Malaysia, Yee En Chan (BA Hons Media with International Relations 2011), has married fellow alumnus Keyang Lew (BSc Hons Software Engineering 2010 and MSc Multimedia Games Engineering 2011). Keyang and Yee En met in 2009, whilst studying at NTU’s Clifton campus. Their first meeting was at the Malaysian Society welcome dinner, when she was the president of the society starting her second year of her degree and he was completing his final year. They grew closer and when Yee En invited Keyang over to her house for a few meals and a bowl of hot porridge she captured his heart and held him spellbound. They were almost inseparable ever since and lived together throughout their time in the UK. When he landed a programming job in the nearby town of Newark, she moved there with him but continued her Master’s degree in Nottingham. In 2013, they came back to Malaysia for good and began to work for the same company. Finally he proposed in April 2017 and they got married legally on their eighth anniversary - 4 November 2017 - followed by a traditional wedding day on 14 January 2018. Their wedding in Malaysia was a perfect venue for the alumni to get together with some flying in from the UK and Singapore. Watch their amazing wedding video here. NTU’s Alumni Relations Team send their congratulations to the couple and wishes them a long and happy future together. In February 2018 James Stephenson from Nottingham Business School hosted 19 Alumni at events in New Delhi, Mumbai and Bangalore as part of his trip to India. Nottingham Business School will be back in India in May visiting prospective students, attending education fairs and connecting with alumni. Please visit our International Visits webpage to keep up to date with in-country activity hosted by Nottingham Business School. Annabel Mitchell and Wole Ibukun, from NTU’s International Development Office, visited Ghana recently and hosted an alumni get together whilst they were in Accra. Two Ghanaian alumni – Claudia and Audrey-Jacqueline - came to meet them at the Coco Lounge. NTU’s International Development Office recently hosted an alumni event in Lagos. 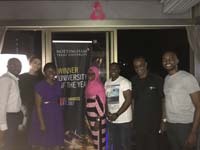 The event in February was held at the Fahrenheit Hotel and was run by NTU’s International Recruitment Officer for Africa, Annabel Mitchell and Wole Ibukun, NTU’s Representative for Nigeria. Find out more about the NTU Alumni Nigeria group run by TJ Bakare (MSc Customer Service Management 2007). NTU alumna Kati Schmidt (BA Hons Politics; 2006) has been shortlisted as a finalist in the British Council Alumni Awards for 2018. Kati, who is a contender in the Professional Achievement award category in the USA, studied Politics at Nottingham Trent as part of an exchange programme from the University of Munster in Germany. She is now based in California, and currently works as a start-up mentor on German Accelerator Tech, aiding German technology start-ups to enter the US market. Previously she worked for Airbnb for six years, eventually moving to their headquarters, where she managed strategic partnerships for the global public policy team, and became the Senior Business Affairs Manager for Airbnb’s Trips team. Find out more about Kati by reading her alumni profile. The final winners will be announced at a national ceremony in Washington DC on Monday 26 March 2018. Best of luck Kati! Applications are now open for our fantastic programme of summer school courses. 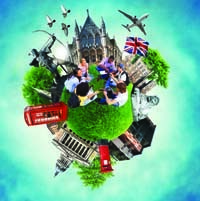 NTU’s Global Summer School have a variety of 2 to 4 week courses from Animation to Sociology. The courses offer innovative ways of learning and earn UK credits for your studies. They run from 9 July – 3 August 2018. Alongside studying, a fun social programme will run with sightseeing activities in Nottingham and visits to other cities. You'll be supported by friendly student buddies who'll get in touch before you arrive and welcome you at your induction. They will also take on you on a campus tour and show you around Nottingham. They may even be studying with you in your classes. Places are limited, so apply as early as possible. If you pay your fees before 31 March 2018 you'll receive a 10% tuition fee discount. The final deadline for applications is 18 June 2018. Find out more here including a full list of subjects available, accommodation options, prices and to book your place. After graduating from Nottingham Trent University (NTU) in 2010, Motohiro Tanji, Japanese MA Fashion Knitwear Design alumnus has since established his own knitwear label. Launched in 2013, Motohiro Tanji is an experimental knitwear label that creates unique textures using both hand and knitting machines, crafting balanced designs ranging from fashion accessories to full-fledged outfits. At this year’s Amazon Fashion Week in Tokyo, he staged an impressive presentation and runway show entitled ‘Reflected in the water’, featuring his 2017 Autumn / Winter collection. Motohiro has been a part of the annual runway show since 2014. He told us: “I first learnt how to knit at NTU, which makes NTU the birthplace of my brand. “Before coming to NTU, I studied fashion design in Japan. When I graduated, I realised I wanted to study fashion knitwear design. I ended up choosing NTU after looking at their graduate collections. I felt that NTU had more technical approach to knitting. South Korean NTU alumni Kang Nak Lee (BA Hons Product Design, 2011) has published a book about his experiences as a student in the UK, titled Ay Up Me Duck. The book uses Kang’s four years of diaries and is “basically all about how I survived in the UK”. In it Kang “starts from day one and finishes on the day I get on the flight back to Korea. It contains the stories of what I studied at NTU, what I have learned, how I got a job, what I have done at work (all the sketches and drawings), and how I met my new born twin babies at the QMC (Queens Medical Centre)”. It contains many illustrations that he drew throughout the book. Unfortunately the book is self-published and is not due to be published in the UK, due to costs. Kang has recently completed some activities to promote his book in South Korea, in conjunction with the British Council. As part of this he held a book launch, and has talked to students who are interested in studying in the UK about his experiences at NTU, in Nottingham and the UK. Two Libyan NTU alumni have received awards from the University of Benghazi for the best research paper. 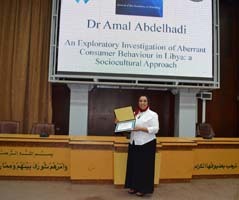 Dr Amal Abdelhadi, who completed a PhD in Nottingham Business School in 2012, won with a paper about consumer behaviour in Libya. Whilst Dr Abdelsalam Saad, who graduated from NTU in 2016 with a PhD from the School of Architecture, Design and the Built Environment, was awarded for a paper about quality management in the Libyan Food Industry. Both research papers were co-authored by current academic staff at Nottingham Trent University. Dr Abdelhadi is pictured after receiving her award at a ceremony on 27 July at the University of Benghazi. The first meeting of the NTU Alumni New York group has taken place, led by the new alumni ambassador for New York – Raj Vora. 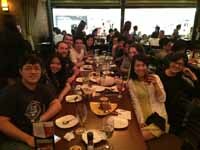 The get together was held at the Churchill Tavern (on 28th and Park) on 3 August 2017, and five NTU alumni came along. Quarterly meetings are now being planned, with the next one possibly being to a hockey game in autumn (or is that fall?). 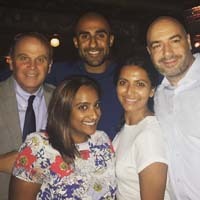 If you are interested in joining in with the group or at the next event, please email us to find out more about joining Raj and the NTU Alumni New York networking group. Are you an international alumnus or alumna of NTU, with a special story to tell? If so, the British Council Alumni Awards 2017-18 are now open for applications, and recognise outstanding achievements in three areas: Professional Achievement; Entrepreneurial; Social Impact. The awards celebrate the achievements of alumni who have studied in the UK, to show the impact and value of a UK higher education. Previous award winners and finalists are leaders in their fields who have used their experience of studying at a UK university to make a positive contribution to their community, profession and country. The awards are only open to alumni living outside of the UK, and you must have studied in the UK in the last 15 years at degree level or above. Find out if you are eligible on the British Council website. The first meeting of the NTU Alumni Japan group has taken place, led the new alumni ambassador for Japan – Itaru Dekio. 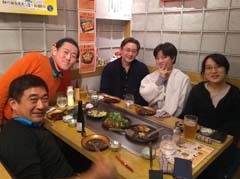 It was held in a Japanese barbecue house – yakiniku - in central Tokyo. Four members of the group came along and as they found lots to talk about, met for about three hours. Another meeting is now planned for August 2017, again in Tokyo. If you are interested in joining in this event, please email us to find out more about joining Itaru and the NTU Alumni Japan networking group. We are delighted to announce our first ever international alumni ambassador for the USA. 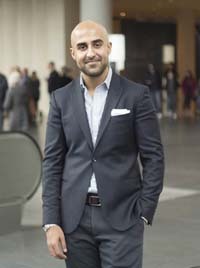 Raj Vora (PG Dip Law 2010) has volunteered to act as the Alumni Ambassador and to help make connections on behalf of NTU in New York. Raj, who is the Director of Inside Sales at SiteCompli, said: “I'm finally at a point in my career when I can give something back to the people and institutions that got me where I am. I would love to connect with others who feel the same way and share some NTU memories with alumni who are also in New York. To join Raj and the NTU Alumni New York group, please email alumni@ntu.ac.uk. You will need to give us your permission to share your information with Raj. Please note that our official alumni ambassadors have to sign a Data Processing Agreement which requires them to hold information securely and in strictest confidence. If you are interested in volunteering to organise a similar group where you live then please email alumni@ntu.ac.uk for more information. 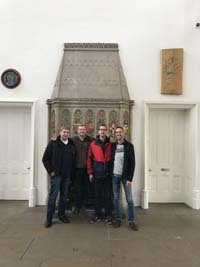 Four German alumni were excited to be back at Nottingham Trent University’s City Campus last week for a nostalgic visit. Jörg Engeln, Olaf Dunker, Stefan Koch and Torsten Taugs attended an exchange semester at NTU in the winter of 1997/98. During their time here they were enrolled on the Manufacturing Engineering course, having all studied a combination of engineering and business in Munich. NTU alumni in Nigeria met with James Stephenson, of Nottingham Business School, and Selma Toohey, Senior International Officer for Africa, at the start of May. 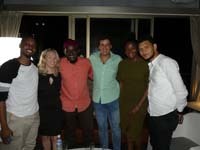 James and Selma hosted an event in Lagos and met with ten alumni from Nottingham Business School (NBS). They let them know about the latest news and developments in the Business School and at NTU, and the alumni updated James and Selma with their news. It was also a great opportunity for NTU Nigerian alumni across the years to meet and network, as alumni from the class of 2007 through to 2016 attended. James and Selma also caught up with NBS Alumni Fellow, Dr Rotimi Olaniyan, (DBA Business Administration 2015). Dr Olaniyan studied at NBS alongside his daughter, Tola, who graduated from MSc Human Resource Management in 2015 and has recently returned to Nigeria and secured a job. Dr Olaniyan is continuing his links with NTU through the Alumni Fellowship scheme which involves him mentoring current students and will be lending his expertise in entrepreneurship by teaching at NBS in September, continuing his family’s strong relationship with NBS. NTU has a large and growing alumni community in Nigeria and hold events throughout the year in Lagos and Abuja. 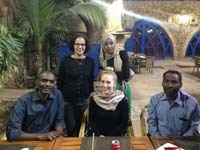 The first ever meeting of NTU alumni in Sudan took place in January 2017, and was hosted by Selma Toohey, NTU’s Senior International Officer for Africa. Selma met with three NTU alumni and a current student, studying for an MRES Global Food Security at Nottingham Trent. Selma showed the alumni videos of the Clifton campus regeneration, discussed what student life had been like for them at NTU, and also presented the alumni with NTU pins. Our Hong Kong alumni started 2017 by meeting up with each other to exchange news. Some of our alumni, through their connection to NTU have become firm friends, and in this first meeting of the year they caught up with each other’s news but also welcomed some first-time attendees for networking. Join the Hong Kong group on Facebook and ensure we have your up to date details so that we can invite you to future events. NTU alumni living outside the UK? Nottingham Trent University’s Vice-Chancellor, Professor Edward Peck, invites alumni based in Beijing to join him at a special alumni reception on Tuesday 1 November 2016 from 1800-2000 at the British Ambassador’s Residencein Beijing. Professor Peck will update alumni on news from the University including the latest developments with our strategic partner universities in China. Drinks and canapes will be served. in advance through our online booking form. NTU’s Malaysian alumni are actively networking – in August they met up for the third time this year to catch up with each other’s news. Here they are in their NTU t-shirts! They met at Belanga Restaurant @ Empire - a family run business for one of NTU’s entrepreneurial alumni Farah Dhiya (BA Hons International Business 2013). The event was attended by alumni from 1995 to 2015, from a variety of disciplines and professional backgrounds. Some alumni have recently formed a committee to share the responsibility of organising future events and contribute to various projects aimed to encourage future engagement and to utilise their NTU network. To join the NTU Alumni Malaysia group email us and join them on Facebook. Nottingham Trent University alumni are invited to join our International Development Office Director Mr David Bailey, Senior International Recruitment Officer Mr Mirza Mujic, and Country Adviser Mr Rishi Pokar for evening drinks and networking. Email rishi.pokar@ntu.ac.uk to confirm your attendance. Amazingly one family, the Oredipes, will have four family members graduating from NTU! In 2015 three members graduated: Kehinde Oredipe (MSc Human Resource Management 2015), Taiwo Oredipe (MA International Development 2015) and Tosin Oredipe (MSc Economics 2015). The fourth family member to graduate in September 2016 will be Adebola Oredipe, currently studying MA Public Health. 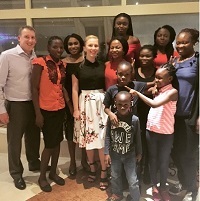 In May, David Bailey (International Development Director) and Selma Toohey (Senior International Officer, Africa) met with the whole Oredipe family, minus three who couldn't make it, for dinner in Abuja, Nigeria. The group were also joined by Muriel Cookey (LLB Hons Law with Business 2014 and LLM Oil, Gas and Mining Law 2016) who had been assisting with an earlier event preceding the dinner. David and Selma were in Nigeria to meet with prospective students joining the University in September and to take part in a debut of NTU Africa cinema advertisements featuring Fehinti Ojelabi (BA Hons Broadcast Journalism 2015) and her two siblings, Fike and Fikun. (current students on BA Hons Business and BA Hons International Relations). Courtesty of alumnus Andy Keith (BSc Hons Applied Biology 1987) and Deacons, Nottingham Trent University alumni enjoyed a cruise of Hong Kong's Victoria Harbour on Thursday 28 April 2016. Co-hosted by NTU's Head of Development and Alumni Relations Tim Cobb, and our Hong Kong Ambassador Chris Tang, alumni enjoyed pizza and drinks whilst catching up with each other's news. Tim Cobb said: "As ever, I was made to feel extremely welcome in Hong Kong and I thoroughly enjoyed this first ever Victoria Harbour cruise with our alumni. 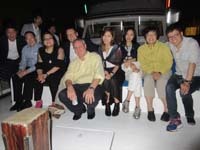 My thanks go to Andy Keith for organising for us to use Deacons' boat, and to Chris Tang who continues to offer great support as our Hong Kong Alumni Ambassador." View photographs from this event. NTU alumni in Korea came together for a party on 19 March 2016. The party took place at Brown Hands Cafe, which is part of a chain owned by alumnus Ki Seok Kim (BA Hons Product Design 2007). If you live in Korean, email alumni@ntu.ac.uk for details of how to join Mihyeong Yu and other members of the NTU Alumni Korea group. 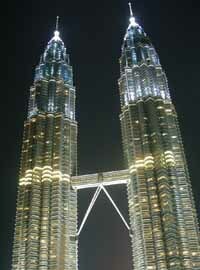 We just wanted to remind you about NTU Alumni Malaysia – a networking group exclusive to alumni based in Malaysia. Alumnus Lawrence Lim (BEng Hons Civil Engineering 2010) organises this group on behalf of NTU’s Alumni Association. Its aim is to keep you in touch with your friends and up-to-date with what is happening at your University, as well as providing networking opportunities in your country of residence. Membership to NTU Alumni Malaysia is FREE – all you need to do is give us permission to share your data with Lawrence by emailing alumni@ntu.ac.uk. You can also join the group on LinkedIn and Facebook. 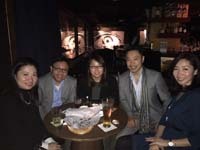 NTU alumni in Hong Kong started the festive season with a drinks reception at Mokum Bar on Tuesday 1 December 2015. Guests enjoyed complimentary drinks and snacks whilst they caught up with each other’s news. 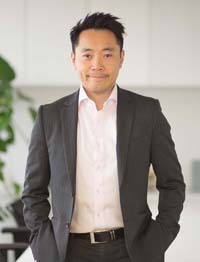 Nottingham Trent University’s Alumni Association would like to take this opportunity to thank Chris Tang for his continued support and dedication in helping us with alumni relations in Hong Kong. We wish all of our alumni around the world the very best festive season. More than 50 alumni and guests gathered at the British Council in Hong Kong on Monday 14 September 2015 to meet Nottingham Trent University’s Vice Chancellor, Professor Edward Peck, who showed guests images of the campus developments that have taken place in recent years, and also shared details of the University’s plans for the future. Find out more and view photographs. Professor Bob Rees (Director of the John van Geest Cancer Research Centre at Nottingham Trent University) and Dr Kevin Loh (a specialist in medical oncology at OnCare Hong Kong) recently gave a talk about developments in cancer research to Hong Kong alumni. Nottingham Business School’s Head of International Affairs Christophe Crabot and Senior Lecturer Dr Gwen Chen hosted an alumni dinner in Taipei in May 2015. The dinner, held at the Gordon Biersch restaurant in the Taipei 101 District, was attended by alumni whose graduation dates spanned three decades. Chris and Gwen enjoyed catching up with graduates and hearing about their latest career moves. The Taiwan Alumni group expect to gather again in the autumn to welcome back new graduates from the class of 2015! On Tuesday 30 March 2015 a group of NTU alumni met up in Sydney – some 10,538 miles from the iconic Newton Building where they studied. We are delighted to announce that three new alumni networking groups have been set up in Europe, thanks to generous alumni volunteers. Nigerian rapper Burna Boy surprised guests at our NTU Summer Party 2014 in Lagos last month. A small group of alumni met up in Pune recently to catch up with the latest news from NTU – and from each other. Almost 70 alumni and friends gathered in Seoul recently at an event hosted by Dean of the School of Art & Design, Marjolijn Brussaard. The event, kindly organised by NTU Alumni Ambassador Kang Nak Lee (BA Hons Product Design 2011), was held on the rooftop of Hotel La Casa. Guests enjoyed food and drinks before Marjolijn updated the group on the latest developments at Nottingham Trent University, including the new Students’ Union building, and news of the latest research. Alumnus Gareth Davies (BSc Industrial Management 2001), who is the Head of Science and Innovation at the British Embassy in Seoul, also told guests about the work of British Embassy. Later there was a showcase of what Korean alumni are doing in their careers, and a raffle. Our first ever event for NTU alumni in Australia took place on Wednesday 25 September. Fourteen alumni and guests enjoyed “prama night” at the Prahran Hotel in Melbourne – and even our Vice-Chancellor, Professor Neil Gorman, was in town to join in the fun. We would like thank organiser, alumna Sue McKnight (PhD Business and Management 2011), for setting up this event. NTU has an alumni group set up in Australia run by alumnus Alex Cox-Taylor (BSc Hons Sport and Exercise Science 2001). If you would like information about joining this group please contact us to find out more. A group of alumni met up recently at Hard Rock Café in New Delhi. 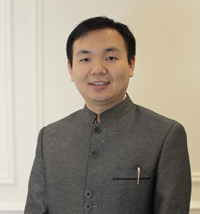 Alumnus Dr Yu Xiong (PhD 2008) has recently been elected to China’s equivalent of the House of Lords. Nottingham Trent University’s International Development Office hosted a summer party in Lagos, Nigeria, on Thursday 25 July 2013. 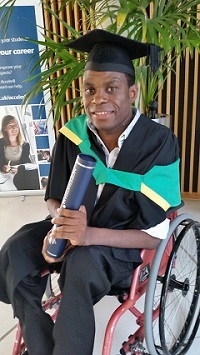 A Nigerian Nottingham Trent University student, who provided Christmas dinners for dozens of fellow international students unable to return home for the holidays, has received a prestigious vice-chancellor's award. Alumni based in Zimbabwe met up recently at the first ever reunion event organised by Nottingham Trent University. International Development Officer and alumna Selma Toohey (BA Hons Politics 2011) was in Abuja again recently. 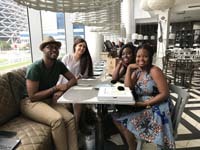 She was in town to meet prospective students to talk to them about coming to study at Nottingham Trent University, but whilst she was their she met up with some of our alumni in Abuja. International Development Office staff Selma Toohey (BA Hons Politics 2011) and Deborah Hinds (BA Hons Media and Cultural Studies & Sociology Psychology 2006) recently travelled to Lagos and Abuja to meet NTU alumni. In Lagos alumni enjoyed a get together at the Radisson Hotel VI, whilst in Abuja former students met up at the Hilton Transcorp Hotel. Pictured right, are the Lagos group enjoying themselves. With our alumni network in India continuing to grow our Vice-Chancellor, Professor Neil Gorman, was delighted to host two receptions in India when he visited recently. Professor Gorman hosted events in both Delhi and Mumbai where he hopes our networks will continue to grow. Guests had the chance to talk to the Vice-Chancellor and International Development Officer, Anna Taylor. In December 2012 our Taiwan alumni met up at a pub in Taipei called 'On Tap', owned by an NTU graduate. The 14 friends ate a traditional Christmas dinner and had a Christmas themed quiz. There was a business card raffle and a 'bad secret santa' where everyone spent $50 dollars (about £1) to try to get the worst present possible. The winner got a prize – a pack of bin liners! Communicate with NTU alumni based in your country and join one of our official groups. You can see a list of those currently set up. The newest has been created especially for alumni based in the Czech Republic and Slovakia. These NTU groups will keep you up-to-date with news from your University, as well as providing networking opportunities in your country of residence. Update your details by logging into Venture Online, your alumni online community. Login or register here. Once logged in as a full member select 'Update my details'. Once you have updated your information, email us at alumni@ntu.ac.uk to give your permission for data transfer to the relevant alumni ambassador/ group contact. Please note that our official alumni ambassadors have to sign a Data Processing Agreement which requires them to hold information securely and in strictest confidence. Please read our Data Protection statement for more information. If you are interested in volunteering to organise a similar group where you live then please email us for more information. Check out our map to find out how many alumni live in your part of the world. Five officers selected from the Deputy Public Prosecutors and Federal Counsel in Malaysia have become the first to graduate from a bespoke LLM in Advocacy Skills, which was exclusively developed by Nottingham Law School on the request of the attorney general of Malaysia. Ten NTU students will be jetting off to Beijing this summer to learn Mandarin Chinese and experience the local culture after being awarded this year’s Vice-Chancellor's Mandarin Scholarships. A delegation from Nottingham Law School recently visited the Ministry of Justice and Judicial Academy in Vietnam to discuss the creation of a bespoke LLM in Legal Practice to develop the skills and knowledge of the country’'s lawyers. NTU and Chongqing University in China have agreed a new partnership for collaborative research and staff and student visits. The agreement has been arranged through the University’s School of Education and three professors from Chongqing University recently visited Nottingham to finalise the partnership. Around 900 Nottingham Trent University Alumni are based in Hong Kong – and almost 100 of them attended a special alumni reception on 21 March 2012, hosted by our Vice-Chancellor Professor Neil Gorman. A new international partnership has been agreed between Nottingham Law School and the Ghana School of Law to work together on curriculum development. Endorsed by the General Legal Council of Ghana, the agreement provides a more formal framework for the two institutions to learn from each other and offer mutual assistance. Nottingham Business School is taking its successful Doctorate in Business Administration (DBA) programme into new territory with the launch of its Dubai programme. NTU alumni based in Taiwan enjoyed a special reception on 29 April 2011 at Alleycats Restaurant in the well-known Hua Shan Cultural Park in central Taipei. To tie in with the Royal Wedding, the event had a red, white and blue theme – also reflecting the shared colours of the British and Taiwanese flags and the NTU logo. Guests were asked to wear an item of clothing which is red, white or blue. On 4 December 2010 alumni in Hong Kong enjoyed a special reception where they met up with NTU staff, their university friends and networked with other former students based in Hong Kong. The event was hosted by Vice-Chancellor Professor Neil Gorman who told alumni and guests all about Nottingham Trent University’s latest news and developments. A selection of photographs from the event can be viewed here. Nottingham Trent University was delighted to invite alumni based in China to a special reception in Beijing on 7 December 2010. Hosted by Vice-Chancellor Professor Neil Gorman it was an opportunity for alumni to meet up with representatives from NTU and network with each other as well as hear the latest news from the University. Adrian Jones (BSc Hons Industrial Management 1993) has been appointed the General Manager at LEGOLAND® Florida which is due to open later this year. Most of the NTU Alumni China group work in big cities, so recently they decided to have some time off and have some fun together so they met up at ShenTangYu, in HuaiRong District, 65km away from downtown Beijing. 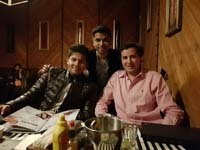 Alumnus Mayur Sharma (BA Clothing Studies with Textiles 1996, MA Fashion and Textiles 1997) combines his love of food with his passion for travel as the presenter of the award winning Indian TV show Highway On My Plate. NTU Alumni China met up again recently to celebrate the beginning of the New Year. Organised by NTU Alumni Ambassador Du Ning (MSc Civil Engineering Design and Management 2005), they met up in a special restaurant which served Zhejiang-shanghai flavour food. Ten students from Nottingham Trent University have been awarded scholarships to learn Mandarin in Beijing this summer. The NTU Alumni China and Friends party on 13 March 2009 gave graduates a great opportunity to meet Mr Du Ning, China's new alumni ambassador.